The league’s not over yet. After a lively Clásico on Saturday, the Camp Nou is set for yet more action on Wednesday night as Villarreal are the visitors for an 8.00pm CET kick-off (TICKETS), a game that was originally postponed due to the Catalans participation in the Copa del Rey Final. 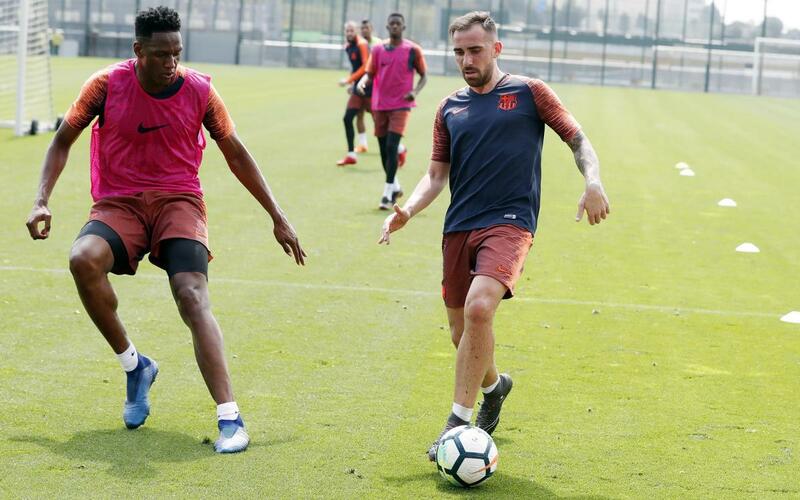 Ernesto Valverde already knew he’d be without Sergi Roberto, who’s suspended after being red-carded against Real Madrid, and Samuel Umtiti is out as well due to problems with his left knee. Denis Suárez and Aleix Vidal have also been dropped from an 18-man squad that reads as follows: Ter Stegen, Cillessen, Semedo, Piqué, Rakitic, Sergio Busquets, Iniesta, Suárez, Messi, Dembélé, Coutinho, Paulinho, Paco Alcácer, Jordi Alba, Digne, André Gomes, Yerry Mina and Vermaelen. There’s more football to come at the weekend, with Barça off to Valencia to face Levante at 8.45pm CET. So there was plenty to think about on Tuesday evening as the team trained on the Tito Vilanova field at the Ciutat Esportiva Joan Gamper, where the regulars were joined in the workout by Carles Aleñá of Barça B.